A big thank you to the lovely Julia Williams, who tagged me in this meme. Some wonderful writers have been answering the questions, then tagging others… check out the bottom of this post for my tagged authors, who all come highly recommended. The working title has been a lot of things, but it’s currently ICEFALL. It might change again. The book is fourth in a series called REBEL ANGELS. I always wanted to write a fantasy set in contemporary Scotland, and when I set out to be a full-time writer, the first book in the series (which eventually became the second – I had to go back and write a prequel!) was my first attempt at a novel. Back in those days, it was called WATERSMEET, and it wasn’t very good. I’ve taken time away from the series over the years, and have had many other books published in between the REBEL ANGELS instalments, but FIREBRAND (Book 1) was eventually published in 2010. 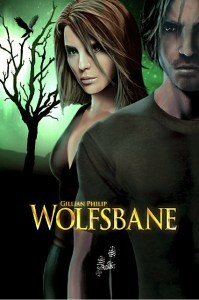 BLOODSTONE and WOLFSBANE followed in 2011 and 2012. ICEFALL will be the fourth and final volume. I chose faeries as my characters (big tough ones, not little fluffy ones) because way back in 2003 there weren’t many faery books. Which shows how things catch up with you in publishing, because now there are plenty of the blighters around. The myths about the Sithe/Sidhe/Sith, as the faery race is known in Scotland, often involve a ‘veil’ that conceals their world from ours – I wanted to write about what would happen if that veil was not a permanent structure, but one that could be damaged or destroyed. And if the veil failed, and that world was revealed to ours, who would that threaten most – us, or them? I created clanns who were at war over this very issue, and the story grew from the characters. It’s fantasy, both historical (FIREBRAND) and contemporary (BLOODSTONE, WOLFSBANE and ICEFALL). Like a lot of writers, I spend a great deal of time playing this game. Conal, the leader of the MacGregor clann, would be played by Alexander Skarsgard. The role of his brother Seth has been reserved for a long time for Billy Crudup. Seth’s lover Finn would be either Christina Ricci or Natalia Vodianova; and Kate NicNiven, the evil queen, would have to be either Rebecca Hall (in full Parade’s End mode) or Christy Turlington. Natalia V and Christy T are models, but that’s allowed because this is my fantasy casting session. ‘Kay? Clann meets clann in the final showdown – and this time, it’s to the death. Will your book be traditionally published, self-published or represented by an agency? My UK publisher for the Rebel Angels books is Strident; in the States they will be published by Tor (the first book there comes out in February 2013). I’m represented by the brilliant Sarah Molloy at AM Heath & Co. I don’t plot, because I’m terrible at it and because I like my characters to surprise me. I may have a rough plan, but nothing detailed or definite. Which is all very well, but after I’d written the first three books in the series I came to a dead halt, realising I had no idea how I was going to get my characters out of the mess I’d created for them. So about three years ago I went off for a few days to a cottage on a cliff, lent to me by an incredibly kind friend, and took the characters with me. (It only sleeps 6 or 8, but the whole clann managed to squeeze in.) I began their story on that clifftop, and took it from there. The first draft took about four months, but it’s been reworked many times since then, and I’m about to begin the final rewrite. Gosh. Tricky one. I don’t like to think it’s too similar to any – and I bet most authors say that – but I’ll extend it beyond its immediate genre and say that it’s Bernard Cornwell (The Last Kingdom) meets Lian Hearne (Across the Nightingale Floor), and is savagely ambushed by Mark Lawrence (Prince of Thorns). My late father, who always thought I could be a writer; my late English teacher Mrs Dutch, who encouraged me; and the writers who kept me awake under the bedclothes with my torch when I was a kid. As for what: that would have to be the Scottish landscape and the myths that live in it. As anyone who has read the others in the series will expect, not everyone gets out alive. I’m not sure my characters will even promise me a happy ending – but I know they’ll have fun getting there. And now – my tags! Jonathan Pinnock is a Twitter pal of mine who has made extremely free with the reputation of one Mrs Darcy, not least in his YouTube epics. He has had over a hundred stories and poems published in places both illustrious and downright insalubrious. He has also won quite a few prizes and has had work broadcast on the BBC. His debut novel Mrs Darcy versus the Aliens was published by Proxima Books in September 2011, and his Scott Prize-winning debut collection of short stories, Dot Dash, was published by Salt in November 2012. He blogs at www.jonathanpinnock.com and he tweets as @jonpinnock. Michael Malone is another very talented reprobate. He has published over 200 poems in literary magazines throughout the UK. (His career as a poet has also included a very brief stint as the Poet Laureate for an adult gift shop. Don’t ask.) His debut crime novel Blood Tears won the Pitlochry Prize (Scottish Association of Writers) and was published June 2012 by Five Leaves. His next publication, Carnegie’s Call, is a non-fiction work about successful Scots, released in October 2012. He reviews regularly for the popular crime fiction website crimesquad.com and he blogs here. He wants his tombstone to read that he never ate enough mars bars. Kathryn Evans calls herself “the woman who was so nearly good at so many things”, but the truth is she is brilliant at all of them: belly dancing, fencing, writing – not fire-breathing though. She never fancied that. She has just finished a teen novel, and her agent is just sending it out so she’s VERY NERVOUS (though she doesn’t have to be – I bet you anything). She blogs here at Mrs Bung, where her Next Big Thing post is going up today; she is one of the mad poets at The FunEverse; and she tweets as @MrsBung too. Maria Duffy is another writer who spends her days creating impressive words counts in the absolute THOUSANDS, but all split into 140-character tweets (and you can find them @mduffywriter). Her warm and funny romantic novels include The Terrace and Any Dream Will Do. For Hello! magazine’s online blog Stars in the Twitterverse, she has interviewed celebs including Eamonn Holmes, Jedward, Carol Vorderman, Gino d’Acampo and Wonderland. Born in Dublin, she now lives there with her husband and four children. Her Next Big Thing post is here today. Karen Saunders writes for children and teenagers about mermaids, fairies, cars, teenagers, princesses, superheroes and more. She is incredibly accident prone; her favourite words are ‘eclectic’ and ‘catkin’. She looks like Tina Fey in some lights, and Christina Ricci in others, which means she can take the part of Finn in the Rebel Angels movies. Her books include Baby Badger’s Wonderful Night and, coming in January 2013 from Templar Books, Me, Suzy P. (That’s Suzy PUTTOCK WITH A P.) I very much appreciate her allowing me to tag her while she was sleepless with a barfing toddler. And she tweets as @writingkaren.